During the last year I've been on the look out for new category romance authors to add to my list of old favorites. Recently, Wendy mentioned A Not-So-Perfect Past by Beth Andrews as a book she recommended and after doing a bit of research I decided to read the following three books by this author. 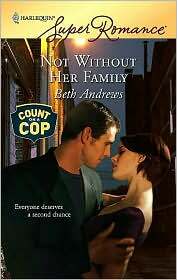 The following three SuperRomances by Beth Andrews are all related, although they can all be read as standalone books. They are all set in the small town of Serenity Springs. The protagonists from all three books are related to each other -- brothers and sisters. With the exception of two characters, our protagonists are introduced in the first book. She claims she has to make things right... It's nothing but trouble for Jack Martin, chief of police, when Kelsey Reagan blows into town. Her ex-con brother just became the prime suspect in a murder, and this reformed bad girl vows to prove he's innocent. She even blames herself for her brother's jail record for her brother's convicted crime. And now Jack's precocious young daughter is beginning to idolize Kelsey. But an error in judgment nearly cost the widowed cop his career once; he's never going to let that happen again. Not even for a gorgeous troublemaker like Kelsey. Kelsey's a former bad girl and comes to Serenity Springs to make peace with her brother Dillon. She has a past history of making mistakes and is here trying to make things right with the only family she has left. The first person she meets when she blows into town is Chief of Police Jack Martin and he's one suspicious man, never mind that he's gorgeous. Jack can't help but drool over the woman he finds at his sister's bar while it's unattended, but he's a cop and no easy target, even when later the attraction turns out to be mutual.When Kelsey turns out to be Dillon's sister, the only ex-con in town, and Dillon becomes the suspect in a murder, Jack suspects that Kelsey will use their attraction to sway his good judgment. He's a widower and a single father and can't afford to make mistakes that will affect his daughter or his career. Not Without Her Family is a story full of suspicions and self-doubt. Both Jack and Kelsey have baggage and their vulnerabilities are explored in this story. As a cop, Jack used bad judgment once before and he's afraid that Kelsey might influence his actions while investigating the murder. Kelsey on the other hand has good reasons to distrust cops, is not the motherly type or ready for a commitment -- she has a tendency to run when things get hot and heavy. Dillon (A Not-So-Perfect Past), who is introduced in this story, is a brooding and bitter character who doesn't even want to see or talk to Kelsey. The scenes between the brother and sister are tense and heartbreaking. Nina Carlson knows all about Dillon Ward. Knows he served time in prison. Knows nobody put out the welcome mat when he moved to Serenity Springs. But that doesn't stop her from renting him a place to live. And when someone crashes into her bakery, he's just the man to fix the damage. And Nina isn't the only one who thinks Dillon's the perfect man for the job: her two kids have taken a shine to him. Still, she can't afford to get close to Dillon, even if he is tempting her to toss out her goodgirl shoes. Because it's not that she doesn't trust him. It's that she doesn't trust herself. A Not-So-Perfect Past, is Dillon's story. He's Kelsey's (Not Without Her Family) brother and an ex-convict who did time for murdering his step-father. After living and working as a freelance carpenter in Serenity Springs for a few years, his only friend is Allison Martin (A Secret Agenda). And after being accused of a murder, he has become a pariah and no one in town is hiring. When his beautiful landlady Nina Carlson asks him to vacate the premises above her bakery, Dillon has had enough and decides to leave town. Nina a divorced mother with two children, allows her ex-husband and family to influence her actions and to avoid a confrontation with them, asks Dillon to move out. But when a young man crashes his fosterparents' truck into the bakery, Nina asks Dillon's help and he comes through for her. This was actually a wonderful book and even though Dillon is introduced in the first book of this series, it stands alone quite well. As a male protagonist, Dillon was well developed and I liked him from the beginning. He broods and is clearly traumatized by his past experiences, as the story goes along his vulnerabilities are slowly exposed and his tenderness, loyalty, passion and love come shining through. I loved seeing this character unfold and grow with the story. Nina on the other hand grew on me as the story developed. She's a woman who has no self-esteem and lets her family and ex-husband run all over her -- a frustrating situation at the beginning of the story. However as with Dillon's character, there's marked growth in her character by the end of the story and I was quite happy with her development. His Secret Agenda focuses on Allison Martin, Jack Martin's sister. She is first introduced in Not Without Her Family, but as Dillon's best friend, her character makes appearances in all three stories. Allison is an attorney who gave up her practice in New York City to run a Bar and Grill in Serenity Springs. No one knows exactly why she gave up her successful career and although they suspect there are deeper reasons for her actions, they accept her brief explanations that she needed a change. However, her past is about to come back to haunt her when good 'ole boy Dean Garrett blows into town. Dean was hired to do a job and getting close to Allison is the only way to it. He's used to using his charm to get his way, but he has never broken the rules. But as the tension builds and times goes by, the sizzling attraction between the two makes this a tougher assignment than he thought possible. Now here's a relationship built on lies. Allison is known to be a soft touch, she hires people who are in need instead of those who are qualified. Dean suspects Allison broke the law when she was an attorney, and he needs her help to find his quarry. However instead of asking her directly, he goes undercover and as he falls for her, proceeds to have a relationship with her built on lies and deception. Allison, makes mistakes in judgment and refuses to accept them along the way throughout this story. She also lies to her friends and family. I initially liked both Allie and Dean, but frankly after a while I didn't love either one of them. Although these two have some great sizzling moments and I enjoyed the sexual tension and build up between them, in the end there's little room left to sympathize with these characters. There's no real change in Allie by the end of the story -- she continues to show poor judgment and only sees the consequences when they are pointed out to her by others, and she never comes clean with her family. Although Dean has reasons for his deception and he did show some personal growth along the way, the timeline was so quick that I thought this story didn't feel complete. The "happily ever after" felt rushed and abrupt without too many insights and the forgiveness and realizations didn't feel real to me. 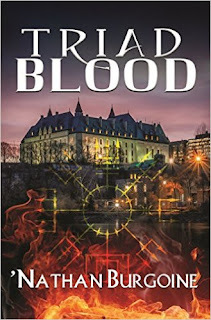 Visit RITA Award Winning Author Beth Andrews here. I still need to get my hands on the first book. Loved, loved, loved A Not So Perfect Past, which won Andrews a RITA this year. I liked His Secret Agenda, but yeah - I needed more growth to Allie's character. Given her past experiences, her work as an criminal defense lawyer....I don't know. I guess I expected her to be more jaded than she was. Wendy, thanks for the recommendation. :) The first book was a great introduction to this series and all the characters -- especially Dillon. I really enjoyed A Not-So-Perfect Past, great development and wonderful characters. I've got A Not So Perfect Past in the tbr pile due to Wendy's review. :) It looks like it's the best of the bunch! Leslie, I hope you enjoy ANSPP, it is the best in the bunch. I liked the feel of the whole series, though.